Joe Adler might be the unofficial king of the Queen City music scene. As music curator and general manager at Radio Bean, he is responsible for booking the venue's diverse music schedule and ensuring that everything from sound check to last call runs smoothly. Adler also coproduces the Precipice, the annual music extravaganza held at Burlington College. To top it off, he played in former nine-piece eclectic outfit the Wee Folkestra for several years and also offers freelance booking services and produces albums. Those myriad talents, experiences and influences converge to make Adler's debut album, Many Things & Many Scenes, a treat. The 11-track album was recorded in Shelburne at Mercurial Arts & Sciences, and was coproduced by Brett Hughes. It features 18 — yes, 18 — of Adler's friends and former bandmates, including Samara Lark, Gregory Alexander, Johnnie Day and Eric Segalstad, as well as Zach duPont of the DuPont Brothers. And what Burlington musical hodgepodge would be complete without Kat Wright and Josh Weinstein of Kat Wright & the Indomitable Soul Band? While the lineup is a certainly a who's who of the local music scene, the album gracefully avoids the feeling that too many cooks are in the kitchen by folding individual talents into the overall aesthetic. The resulting sound is a pleasing, swirling mix of genres too numerous to name. Sections of saxophone and trombone recall the days of big-band music and moments of doo-wop vocals from Sarah Grant and Aya Inoue add to the older-era vibe. Yet folky rock is still present. A proper troubadour, Adler performs all lead vocals and acoustic guitar. His voice is deep, gravelly and understated, which pairs nicely with the circus of music that often surrounds it. Tracks such as "Shoreline In Jersey" and "Many a Girl (Back of a Sail)" are lyrically casual, but are grounded in Adler's conversational tone and the soaring vocals of Lark and Wright. With only Robinson Morse on bass and Segalstad on the shamisen — a three-stringed Japanese instrument — "Cloudy Mind" offers a break from the heavy instrumentation of the other tracks. The spare picking allows Adler to sing simply and honestly, "Mark my address / and write me a letter / and please mail it / just as soon as you can / because I'm gonna miss you." With Inoue's lush accompanying vocals, it's an ideal tune for daydreaming. On Many Things & Many Scenes, Adler doesn't thrust himself into the spotlight, and that's what makes it successful. He acts as a humble guide, walking us through the tracks with reserve and wisdom, while the chaotic and beautiful show unfurls around him. 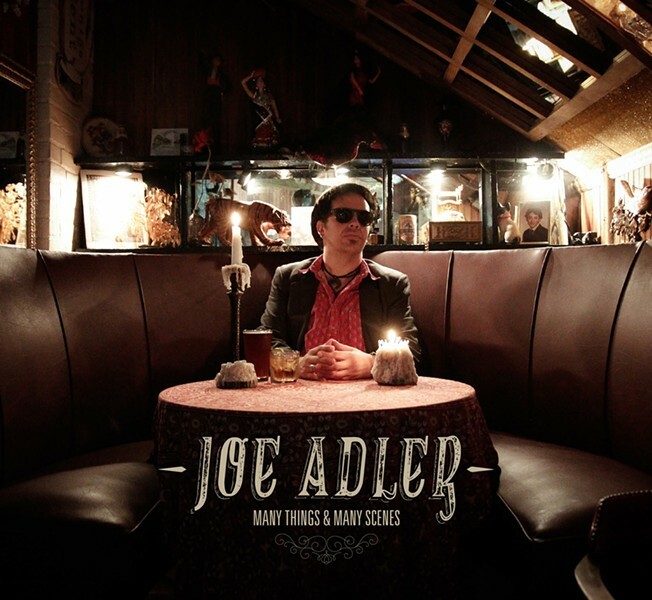 Joe Adler plays a release party for Many Things & Many Scenes at Nectar's on Saturday, September 6, with members of his band, Joe Adler & the Rangers of Danger, and special guests joining throughout the evening. The album is available at joeadler.bandcamp.com.